Why Should You Choose the Krutch Kaddy Crutch Bag? One of the only crutch bags with a zippered main compartment, the Krutch Kaddy keeps essential items safe inside the bag even when crutches fall (and they do fall). The main compartment also houses sewn-in individual holders for a variety of personal items keeping them securely in place and easy to find. 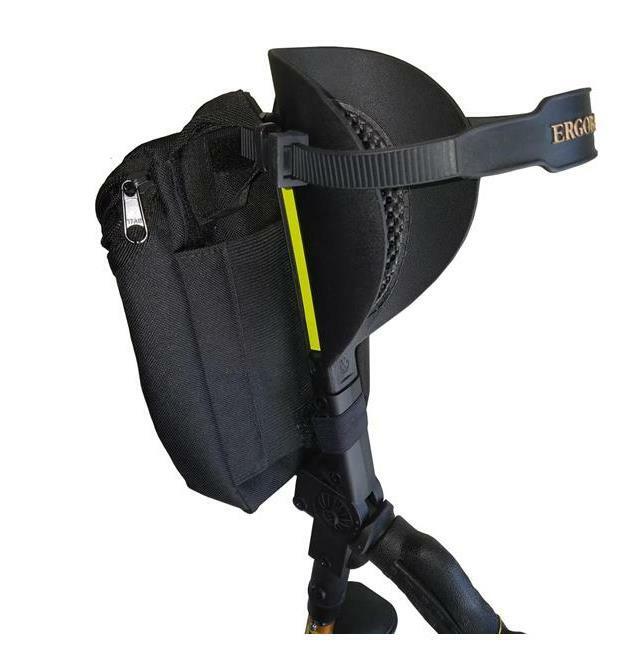 The Krutch Kaddy crutch bag attaches quickly and easily to standard underarm and/or forearm crutches. Positioned comfortably near the handgrips, your personal items are conveniently located and readily accessible. 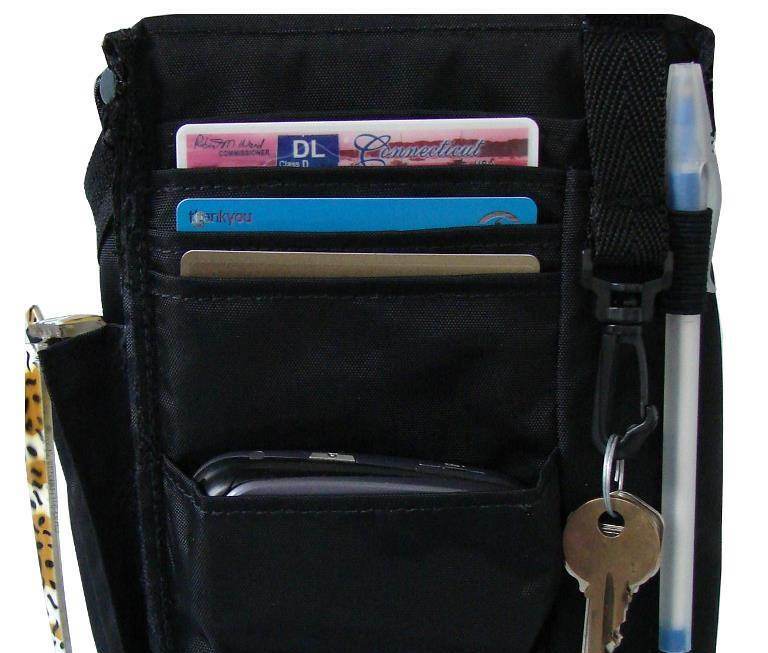 An external net pocket holds keys, a phone or water bottle for quick and easy access. The Krutch Kaddy® crutch bag can be used with forearm crutches, walkers, wheelchairs, hospital beds, baby strollers, bicycles, golf carts, shopping cart, and much more (Even as a doggie Back Pack, attached to harness and leash). It's so much more than just a crutch bag. 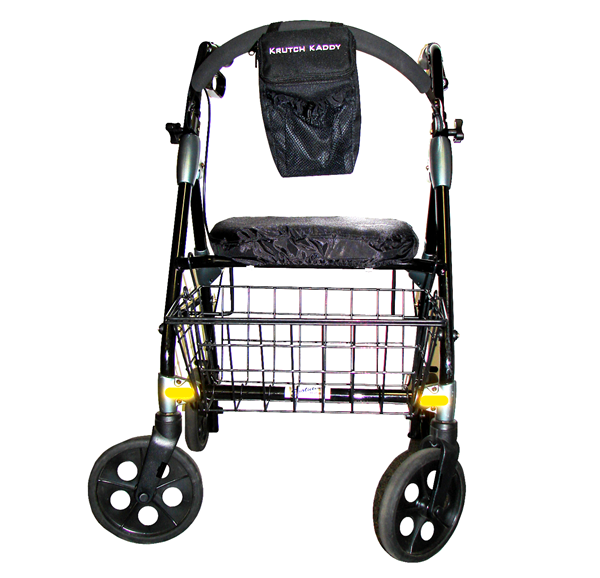 Designed with safety in mind, the Kaddys light weight and small size will not hinder balance or gait. Furthermore, the attachment mechanism will not support an unsafe weight. The Kaddy is weather resistant to help keep your items dry on rainy or snowy days. Quality and workmanship goes into every Krutch Kaddy made. At 9” x 6” x 3”, the crutch bag is small enough not to hinder movement or gait, yet it provides ample space for essential personal items. How Is Krutch Kaddy Made? ·The Krutch Kaddy is made of durable denim pack cloth that is easy to care for and weather resistant. ·The interior of the bag is beautifully finished and completely lined with a polyester nylon fabric that also houses sewn in holders to keep items secure and easy to find. ·Interior seams are reinforced with a bound seam finish to prevent fraying, stop the zipper from catching on fabric and neaten overall appearance. 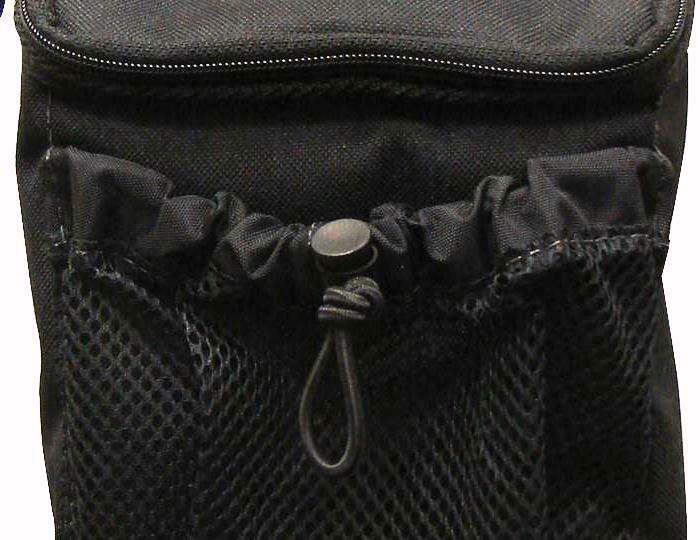 ·The primary attachment mechanism is sewn into the elastic backing located on the rear of the Krutch Kaddy. 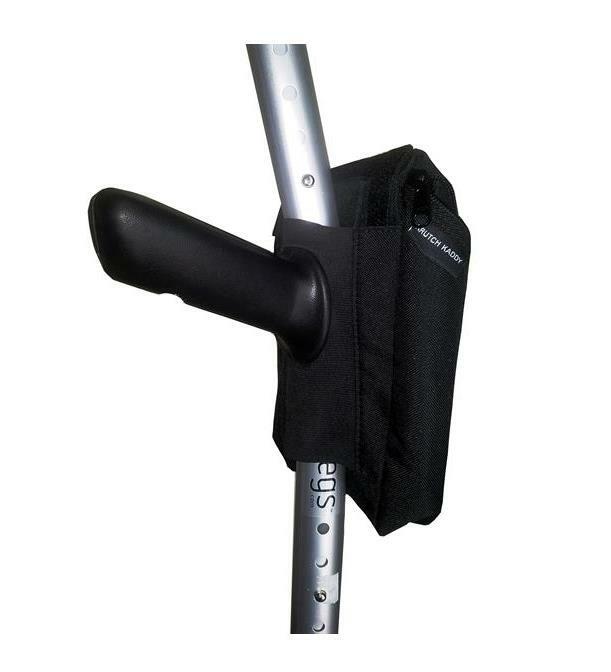 Two rubber strips grip the crutch frame holding the bag securely in place. Machine Wash - Gentle Cycle in cold water using a mild detergent. Do Not Bleach as it will damage and discolor the fabric. Do Not Iron, heat will damage internal and external fabrics. 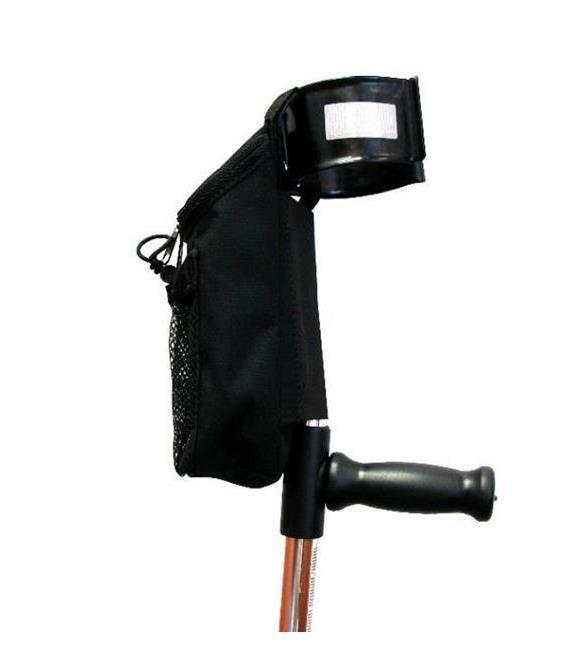 Can the Krutch Kaddy crutch bag be used with forearm crutches? Yes, the Krutch Kaddy can be used with standard forearm crutches. It can also be used with Mobilegs, Eurostyle or Ergobaum style crutches with minor modifications. Just let us know what type of crutches you’re buying for when ordering and we’ll make sure your get the right version. How do I install the Krutch Kaddy crutch bag? To attach the Krutch Kaddy to underarm crutches, simply insert the foot of the crutch into the elastic backing and slide the Kaddy up the crutch frame. The special grips will hold the Kaddy tightly to the frame. Do you have to take the crutch apart to install the Krutch Kaddy crutch bag? When attaching the Krutch Kaddy to forearm crutches, how it attaches will depend on the crutch style. 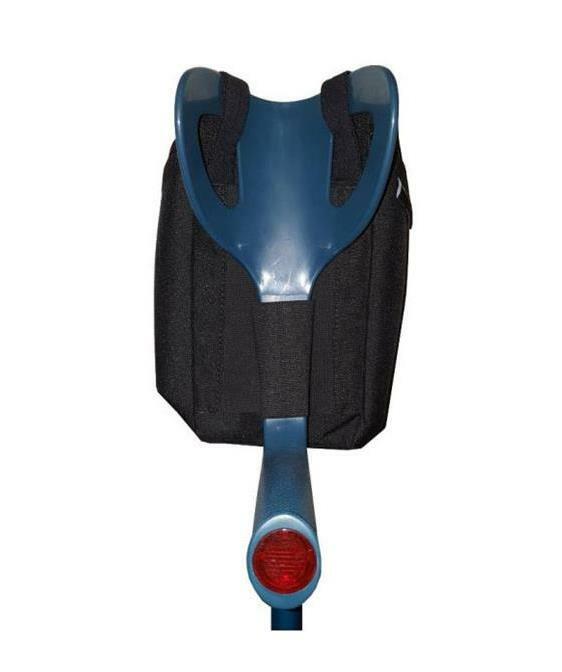 For Mobilegs and standard forearm crutches, it will require either removal of the cuff or the handgrip. For Eurosyle and Ergobaum styles, the Krutch Kaddy will have a special strap to attach it to the crutch frame. Can I carry a water bottle in the Krutch Kaddy crutch bag? Yes, the exterior pocket will hold a beverage up to 16 oz. Can I fit a book in the Krutch Kaddy crutch bag? Yes, the interior pocket can easily hold an average sized paperback. Can I carry a cell phone in the Krutch Kaddy crutch bag? Yes, the interior of the Krutch Kaddy has a sewn-in holder your cell phone and you also have the option of carrying it in the external pocket for quick and easy access. Can I carry a tablet in the Krutch Kaddy crutch bag? Yes, the interior offers a secure zip closure and ample space for a small tablet. We would like to remind you however that crutches do fall and the Krutch Kaddy although slightly padded, may not provide sufficient protection. Electronic devices could potentially suffer damage if located inside the Krutch Kaddy in the event the crutches fall. Can the Krutch Kaddy crutch bag be used with a Walker? Yes, the Krutch Kaddy can be used with any item that has a bar or pole. Items such as walkers, rollators, mobility scooters, hospital beds, etc. What else can I use the Krutch Kaddy crutch bag with? When and if you end up no longer needing the use of crutches, you can also use your Krutch Kaddy with gold carts, shopping carts, bicycles, baby strollers, even with a dog harness. Will the Krutch Kaddy crutch bag get in the way of the hand grips? We recommend positioning the Krutch Kaddy about 1 ½ in. below the handgrip on standard underarm crutches. This will ensure a secure grip on the frame and allow room for a proper grip. When using the Krutch Kaddy crutch bag with forearm crutch, the position of the bag is such that it will not hand from or near the hand grip. With the exception of the Mobilegs style of crutches, it will be positioned between the cuff and the hand grip facing the rear. The straps seem to be backwards, why is this? The straps are intended to loop back onto themselves, they are designed to wrap around the cuff of forearm crutches from the top and come back under so that the hook and loop meet at the back to form a complete loop. This D formation creates pressure on the seal rendering it even more secure. Does the Krutch Kaddy crutch bag come with hand grip pads? No, the Krutch Kaddy does not come with hand grip pads. We hope to have this option available to our customers in the near future. Can I use the Krutch Kaddy crutch bag with gloves? Yes, you can use the Krutch Kaddy with winter gloves. I’ve seen some negative reviews about issues with the zipper and seams. Are these resolved? Yes, in the fall of 2015 we were able to identify a major manufacturing defect that was causing the fabric to fray near the zipper. The fraying fabric would get caught in the zipper and it would not open or close. In an attempt to fix the problem, we trimmed the fabric and suggested to customers to trim back the fabric near the zipper. This lead to the fabric fraying beyond the stitching and un-stitched altogether. We found a new manufacturer, made some design changes and implemented a stringent quality control program. The new design has bound seams to prevent fraying. The straps were lengthened and we upgraded to an industrial strength Velcro. The stitched Krutch Kaddy name was also replaced by a tag. There remains a small inventory of the older version however the seams have been inspected very closely to ensure there will not be an issue with fraying or stitching.